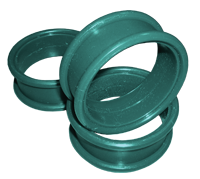 An engineered elastomer grade of polyurethane, Redco™ Ultra 66 is designed for applications where very soft, elastic, rubber-like properties are required in combination with a low-compression set and extreme toughness. Redco™ Ultra 66 also has outstanding solvent and oil resistance. Impact wear liners, wear liners, etc.